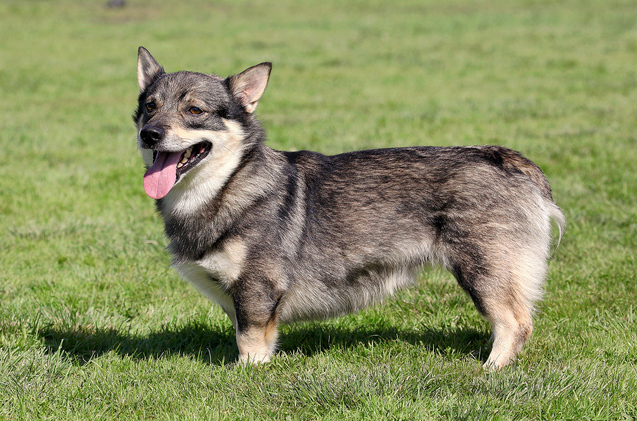 The Swedish Vallhund is an ancient, national dog breed of Sweden and may date back to the 8th or 9th century. The small dog proved to be excellent for watching, guarding and herding. True to his heritage as a working farm dog breed, the Swedish Vallhund is an intelligent and alert companion. He is an active dog who needs an equally active owner. Train him for dog sports or give him a job to do around the house, and you’ll get along fine with him. This is a confident, lively, and curious dog with an independent streak, but he’s loyal to his family and courageous in alerting them to the presence of any strangers or other perceived dangers. The Vallhund is calm and adaptable, making him suited to many different home environments as long as he gets plenty of daily exercise. He loves his people and wants to be with them as much as possible. Count on the Vallhund to keep you entertained. He is described as having a sense of humor and is clever at problem-solving or simply finding new uses for his toys.